In response to President Donald Trump’s order for airstrikes on dictator Bashar al-Assad’s military assets in Syria on Thursday night, the Bolivian government asked for a closed emergency meeting of the United Nations Security Council to discuss the developments. U.S. Ambassador to the U.N., Nikki Haley, warned the South American nation – run by leftist President Evo Morales, whose government is allied with Assad – that if it has plans to defend Assad’s “atrocities” it would not do so behind closed doors. 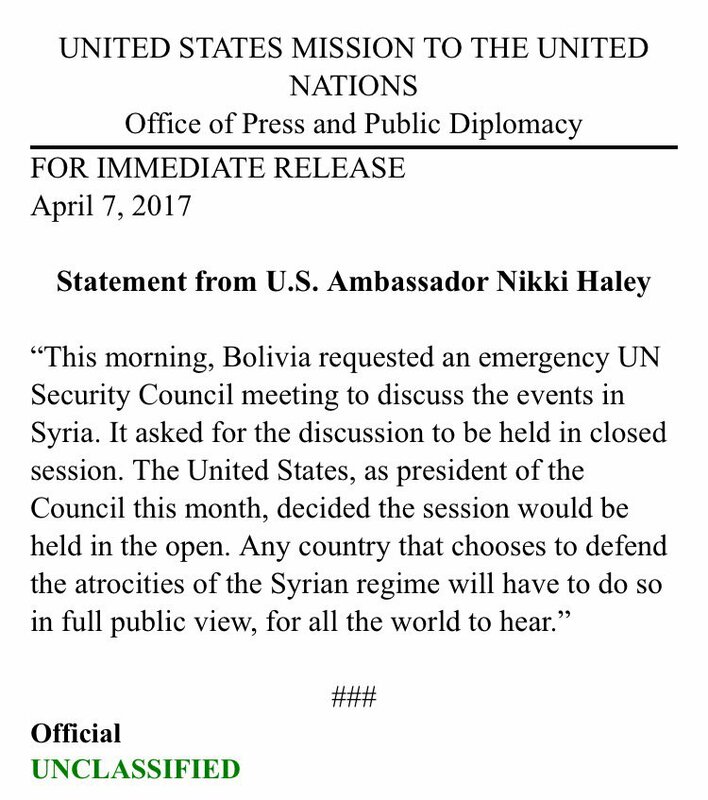 “The United States, as president of the Council this month, decided the session would be held in the open,” Haley said. 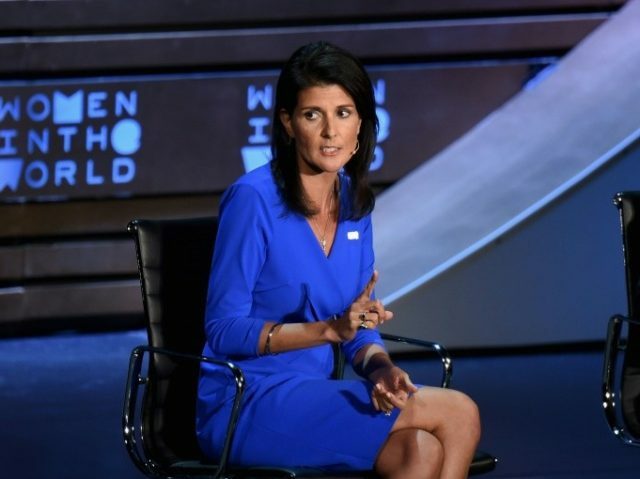 “Any country that chooses to defend the atrocities of the Syrian regime will have to do so in full public view, for all the world to hear,” Haley said. Trump ordered a cruise missile strike against a Syrian regime military airbase in response to a chemical weapons attack carried out by the Assad regime this week that killed dozens of people, including children. Images of dead and dying children posted online sparked outrage around the world. The U.S. launched 59 Tomahawk land attack missiles last night, targeting the Shayrat Airfield located in the Homs Governorate in Western Syria, Pentagon officials said. “The strikes were intended to deter the regime from using chemical weapons again,” Pentagon Spokesman Navy Capt. Jeff Davis said. Davis said the airstrikes targeted aircraft, hardened aircraft shelters, petroleum and logistical storage areas, ammunition supply bunkers, and air defense systems and radars. Davis said the military strategy is to avoid any human casualties and that Russia and “many countries” were warned ahead of the missile strikes. Tonight, I ordered a targeted military strike on the airfield in Syria from where a chemical attack was launched. It is in the vital, national security interest of the United States to prevent and deter the spread and use of deadly chemical weapons. There can be no dispute that Syria used banned chemical weapons, violated its obligations under the chemical weapons convention and ignored the urging of the U.N. Security Council.